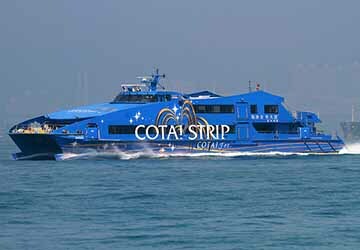 Cotai Water Jet have a large fleet of fourteen ships which are used in the routes travelling between Macau, Taipa, Hong Kong, Kowloon and Hong Kong International Airport. The company was introduced in November 2007, and the vessels have three classes on board, catering to every type of passenger. The cabins vary in space, luxury and comfort, depending on the price of the ticket. Cotai VIP Cabin is the premium option, hosting deluxe armchairs with extra legroom, tables for your carry-on's and priority when boarding and departing the boat. Cotai First have slightly more compact seating arrangements, including leather chairs for you to relax on your journey, and the cheapest ticket is for Cotai Class, with classic seating arrangements. In Cotai VIP Cabin and Cotai First there is complimentary food and drink available to keep passengers refreshed throughout the crossing, and in Cotai Class snacks and beverages can be purchased on board. The diligent and hardworking staff will assist you whilst on board, taking care of your luggage and ensuring you have a safe and comfortable crossing. Please Note: Whilst we have taken great care in making our Castella Square guide as accurate as possible, onboard facilities, services and entertainment may vary depending on the date and time of year that you travel, facilities mentioned may change without notification and ferry companies reserve the right to operate vessels other than those mentioned at time of booking without prior notification.